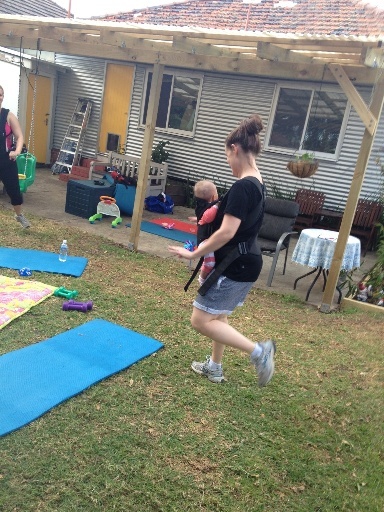 Mums with Bubs Fitness is run by Perth Mummy and certified fitness instructor, Jenine. There are various sessions run north & south of the river, with various session types to suit the varying fitness needs of Mums of young babies and Mums to be. Sessions have been designed to help new mother's enjoy a fun and gentle return to exercise. With special sessions for mothers of babies <6 month, 6-10months and a 10 month + advanced class, that focus on light impact exercise working up to higher impact as baby gets older. Classes are also suitable for expectant mother's, making it perfect for the new Mum to be or for a Mum expecting again! Below is some information on the sessions we reviewed. These sessions are run from Mums With Bubs Headquarters, AKA Jenine's backyard in Doubleview, which offers a private and secure setting. These sessions run for 40mins, in her beautiful garden, and focus on exercises that promote a gentle return to exercise whilst also includeing lots of play, interaction with baby throughout the session. 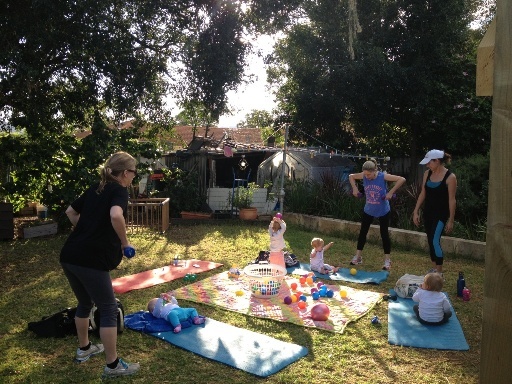 SMALL GROUP PROGRAM < 6 month: max 6 Mums - focuses on light impact exercise, that includes lots of play and interaction with baby, held at Mums With Bubs Fitness head quarters, in Doubleview. Tues, Wed, Thurs & Fri Afternoons - $130 for 5 weeks, with 2 sessions per week. BONUS! If you pay for the 5 week - Ask about half price Pram Fitness Sessions with this package! 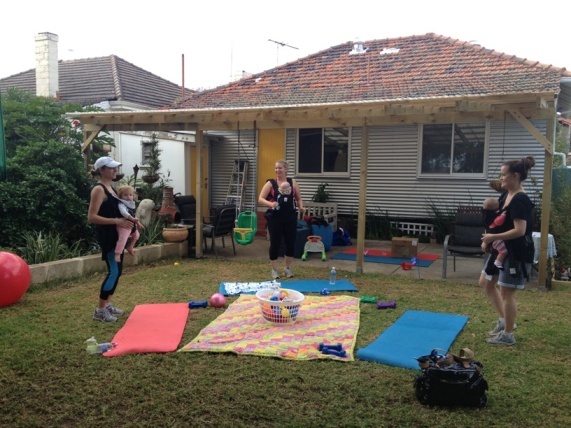 SMALL GROUP PROGRAM 6-10 month: max 6 Mums - focuses on light impact exercise, that includes lots of play and interaction with baby, held at Mums With Bubs Fitness head quarters, in Doubleview. Held Tues & Thurs Afternoons - $130 for 5 weeks, with 2 sessions per week. BONUS! If you pay for the 5 week - Ask about half price Pram Fitness Sessions with this package! Don't have a baby carrier!? That's ok, a baby carrier is optional - the program can be modified to suit your needs! Lots of interaction with baby, Jenine says "babies are either asleep or laughing by the end of each session"
In these sessions babies are around the same age so its also a good opportunity to chat with Mums going through the same parenting experiences... in between puffs that is! SMALL GROUP SESSION 10 months +: max 6 Mums - low to medium impact exercise, that includes lots of play and interaction with baby, held at Mums With Bubs Fitness head quarters, in Doubleview. Wed & Fri Afternoons - $130 for 5 weeks, with 2 sessions per week. Ask about half price Pram Fitness Sessions with this package! Lots of room for crawlers and walkers to play and mingle - no paying for a creche here! Push up kisses! Lots of focus on interaction between Mummy and baby. SMALL GROUP PRENATAL SESSION: max 4 Mums - low to medium impact exercise to designed to maintain strength and fitness throughout pregnancy, held at Mums With Bubs Fitness head quarters, in Doubleview. Saturday mornings - $100 for 5 weeks, with 1 session per week. A gift voucher for any of these sessions makes a great baby shower gift or gift for a new Mum to be! Contact Jenine and ask about gift certificates! 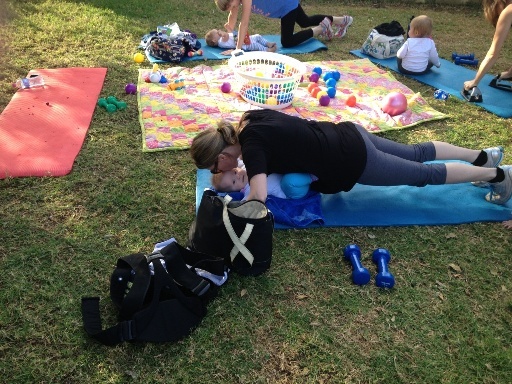 Mums with Bubs Fitness also have programs such as all ages up to 10 months, and pram fitness sessions in various other locations. See the full program here. Session packages or pay as you go options available Small Group Programs and Pram Fitness sessions and and with sessions to meet your personal fitness needs. Please note, times, details and prices are subject to change without notice - information correct at time of publishing however please contact the business for up to date information. Thankyou.